I have decided to have a break from Booksie, although it does seem as if I will be popping in from time to time. This is because I feel there is only so far I can go with my style of poetry. My "one string to my bow" has begun to bore me. I will be trying something different when I return. I was concentrating on my live performances which are based on my poetry but also comedy sets and music. However over the last couple of months I have been occupied by other writing and dancing! and the live performances have suffered. My thanks to all who have supported me. 16 months ago I had never written anything. Now I perform up to three times a month and my priority is to develope my routines. On Booksie I wrote prolifically for over a year and was inspired and encouraged in equal measure by comments and other peoples' work. I have absolutely loved it. Thanks to all the people mentioned below. My email is on this site. I have read a great amount of funny and talented work on Booksie in that time. Unfortunately, except for a few exceptions, most have left for greener pastures. They have left an excellent legacy for us all to enjoy. THANKS to everybody who has supported me and given me confidence over the last 12 months…but particularly, Mike Stevens, Patri Poe, Desilu, Redskelf, Indie Skreet and Ben Hardstaff, Larry Jackson and Bob the Builder. Finally the highpoint of the last 12 months was my involvement in “comedy poetry”. I now perform live on a regular basis and so far so good. My writings are now geared to this in many ways. 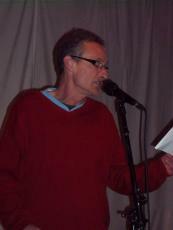 My aim is to produce uplifting poetry which contains humour (hopefully!) to a varying degree. The live performances have made me think of comedy alot more. The link above allows you to judge for yourself. Unlimited posting effecting our brains. Indeed it’s a funnel straight to your site. When other group members are lending a hand. Fresh air needed to inhale. To give it more status is just being daft. Others are needed, then there’s a show.